What do you do when you're craving something sweet? I bake. I was home by myself for a few hours last week and was feeling restless and stressed out. So, I went online and looked for baking ideas. 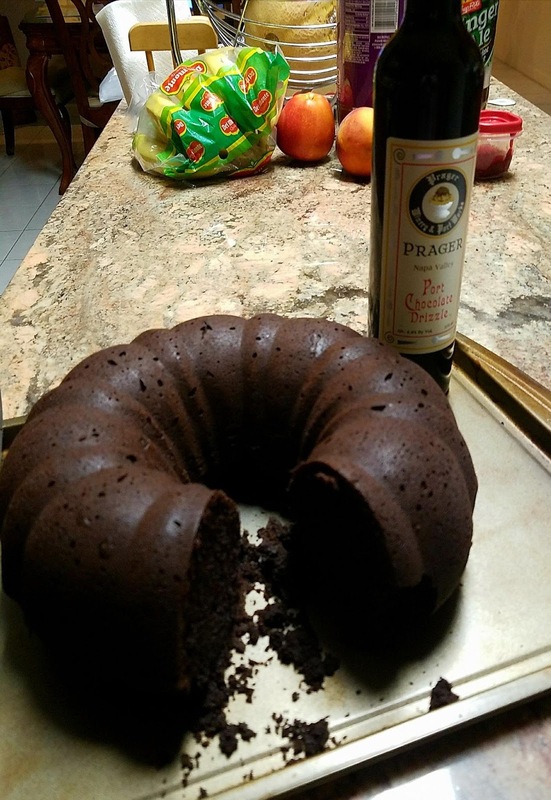 I came across this recipe for Chocolate Bundt Cake by Martha Stewart. I printed the recipe and starting putting the ingredients together before I changed my mind. We didn't have regular milk, unsalted butter, unsweetened cocoa powder or regular sour cream! I Google searched substitutions for butter and found 10 substitutions for butter including olive oil, avocado, Greek yogurt, coconut oil, etc. I settled on coconut oil because it was 1:1 ratio. I also substituted unsweetened cocoa powder with Special Dark Hershey'c cocoa powder and used lactaid milk and fat free sour cream. 1) Make the cake: Preheat oven to 325 degrees. Grease 14-cup Bundt pan with coconut oil. In a large bowl, whisk together flour, cocoa, baking soda, and salt. Mix milk and sour cream in a glass measuring cup. 2) With an electric mixer on medium-high speed, beat coconut oil, and sugar until fluffy, 3 to 5 minutes. Add eggs, 1 at a time, beating well after each addition; add vanilla. Reduce speed to low; add flour mixture in 2 batch, alternating with the milk mixture and beginning and ending with the flour; beat until just combined. 3) Transfer the batter to prepared pan; smooth top with an offset spatula. Bake until a cake tester comes out clean, about 55 minutes. Transfer pan to a wire rack to cool completely. I crossed my fingers, mixed all these ingredients together and hoped for the best. Result? The cake was heavenly. You can't even tell that I made those substitutions. It was moist and sweet enough for me. I opted out of making the glaze as per Martha's recipe. 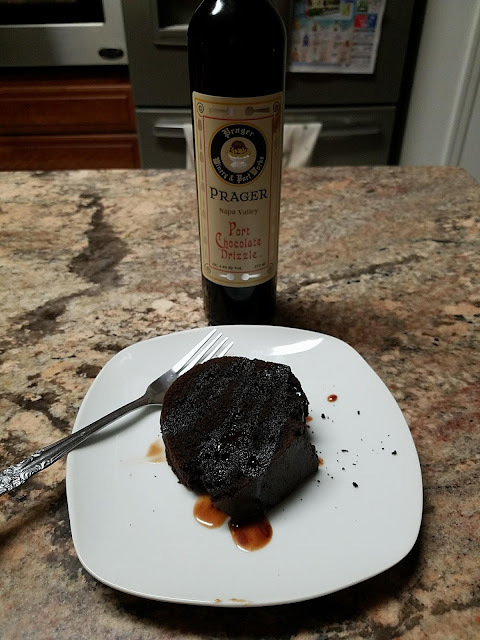 Instead of making the glaze, I poured Prager Port Chocolate Drizzle over slices of cake to make it more decadent. Mama mia, it was delizioso. Can't wait to make this cake again with all the substitutions and less calories...definitely worth it. What do you think?